Why Choose Arizona Luxury Lawns & Greens Tucson? Quality. Value. Service. Don’t settle for less. The team at Arizona Luxury Lawns & Greens Tucson is committed to providing the highest level of customer service in the industry with excellent American-made products. We have more than 45 years of combined experience in the artificial grass industry. Our professional design staff, as well as our highly skilled installers, will ensure your project is handled with the utmost care. We offer the industry’s only 100% satisfaction guarantee. There are many reasons to choose artificial turf for your home. First of all, it’s low maintenance. With natural grass, you need to consider mowing, watering, and fertilizing on a regular basis. If too-hot or too-cold weather occurs, even more care is necessary. Instead, once your initial lawn installation occurs, synthetic grass requires very little upkeep. There is no need for a costly lawnmower or crew to keep your space looking and feeling great. Arizona Luxury Lawns of Tucson offers materials that are environmentally friendly. This is because synthetic turf will only require certain types of infill to help the blades stand tall. Our infill products are safe and non-toxic to both people and the environment. With this infill, you will never have to expose your lawn, family members, or pets to fertilizers or chemicals. We also eliminate the need for weed killers through the use of weed fabric designed to block weeds from creeping through your synthetic grass. This means that you can forget about pulling weeds ever again! Not only does synthetic grass help air quality by eliminating gardening equipment, it also saves a ton of water. A typical natural turf lawn requires 55 gallons of water per square foot per year, which equals 44,000 gallons of water for an 800 square foot lawn. With artificial grass, you can save up to 660,000 gallons over the course of 15 years. The lawn fit to your needs. We understand that your landscaping and backyard are a large investment, and these days trusting your investment to someone who is going to provide quality products and services is more important than ever. Synthetic turf from AZ Luxury Lawns of Tucson is long-lasting and easy to afford. Throughout recent years, synthetic grass has been utilized as an alternative to natural grass. Not only does synthetic grass stay green all year long, but it also aids in multiple aspects of environmental conservation. Fake grass is Arizona Luxury Lawns of Tucson's' top-quality commercial artificial grass product - it is second to none. 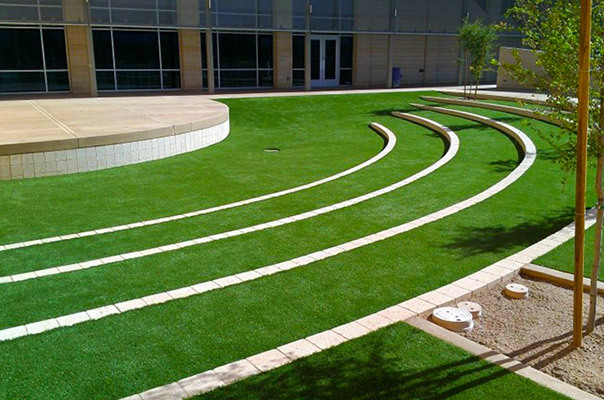 Our artificial grass in Arizona is especially popular for conference center landscaping, big box retail stores, office landscaping, walkways, and playgrounds. Our artificial turf is an ideal solution for golfers, whether you want to install a putting green in the comfort of your backyard, or you own a commercial property. With AZ Luxury Lawns of Tucson, you can install synthetic grass that looks and feels just like the ones professionals use. 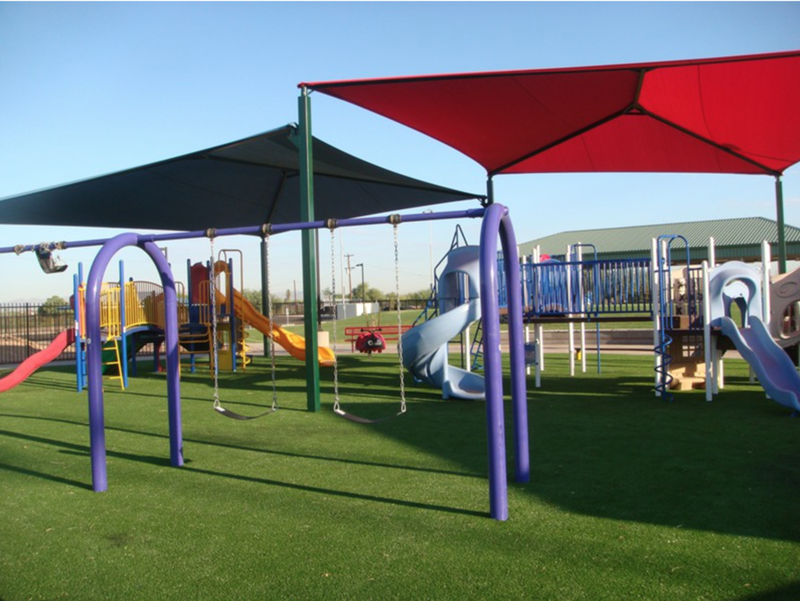 Fake grass installations for southern Arizona schools, playgrounds and athletic fields are meant to hold up to the standards of our youngest customers. Not only should their space be equally fun and safe, it should be long-lasting so that children can enjoy their area for years to come. Arizona Luxury Lawns of Tucson guarantees great service at a low cost to you. In fact, did you know that when you make an initial investment, your expected ROI occurs in just 3-5 years? It’s true! The savings include what you would spend on water, mowing, fertilizers, and hiring a company to take care of it for you. Not to mention the time saved on lawn care. Instead of spending the weekends manicuring the lawn, you can spend more time relaxing on your yard! Our next guarantee is durability. Most artificial turf blades are tufted into the polyurethane backing and each individual blade is designed to handle play, activities, or even a sports team practice. Our synthetic grass can last up to 15 years before needing to replace it. Most synthetic turf products are designed to withstand high amounts of foot traffic and all types of weather conditions. And unlike natural grass, synthetic grass provides superior drainage. It drains at a higher rate and will not accrue mud or pot holes. Our lawns will also dry faster so you can have more time outdoors.